Stunning Italian vintage Murano glass chandelier with two rows of eighteen hand blown glass leaves; each 23-karat "polvero d'oro" (gold leaf flecks). This fixture has been rewired to fit US standards. 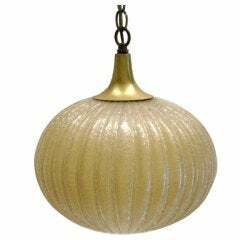 This chandelier is made of blown Murano glass and was produced in Italy in the 1940s. In perfect original condition. Italian Murano glass and brass chandelier. Has floral glass lights with prisms which illuminates at the base. 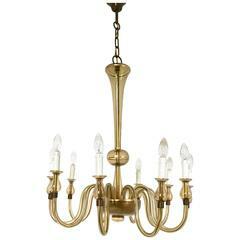 Important Italian vintage chandelier, brass structure and Murano glass shades. 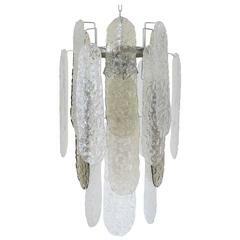 Beautiful Italian vintage Murano glass chandelier, circa 1970s. Unusual clear and smoke crystal combination. In good overall vintage order.